A superior sequel bursting with creativity, genuine warmth and hilarious pop-culture cameos. Six years after the events of Wreck-It Ralph the long-awaited sequel to one of the sweetest and most heartfelt animated satires arrives with Ralph Breaks the Internet. Ralph (John C. Reilly, Kong: Skull Island) and Vanellope (Sarah Silverman) are best friends who get excited when they see Mr. Litwak (Ed O’Neill) is about to plug something new into their power surge bar. Hoping for a new arcade game, they instead get introduced to a Wi-Fi router. Disappointed, Vanellope begrudgingly heads back to her own game, Sugar Rush, but not before telling Ralph she wishes her own game was more exciting, with a new track or something unpredictable. Sensing an opportunity to help, Ralph takes it upon himself to go into Sugar Rush and bust out a new track for her. Seeing it, Vanellope gets excited and goes off script, making the player lose control and actually break off the wheel that controls the racing cars on screen. When Mr. Litwak learns that the wheel is too expensive to replace, he decides it would be easier to just unplug the game and replace it. One problem: unplugging the game mean all the characters will lose their home forever. Vanellope and Ralph can’t let this happen, of course, and quickly devise a plan to venture into the internet itself through the Wi-Fi router and find “the Ebay” in order to get the wheel delivered before the game is unplugged. 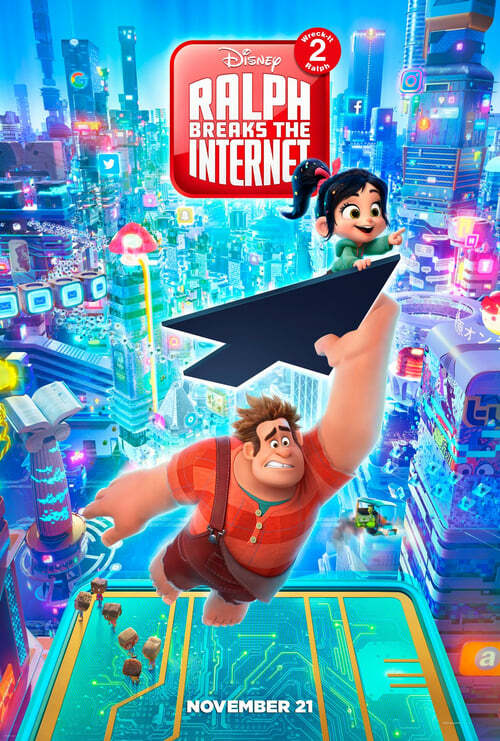 Directed by Phil Johnston (Zootopia, Wreck-It-Ralph) and Rich Moore (The Simpsons), Ralph Breaks the Internet is one of the most refreshing and visually stimulating films from Disney in years. It visualizes the internet like Manhattan at night and super-hyped on sugar while populating this virtualized city with famous faces and popular characters from games, movies and elsewhere. Spotting your favorites is half the fun; Disney princesses get the biggest laughs here – parents should be ready to explain the realities of cartoon monarchies don’t extend to satire. It’s all in good fun, though, as the movie sets up one wildly inventive visual gag after the next in a sequel that’s head and shoulders better than its predecessor. The way Ralph and Vanellope travel through the internet on cyber go-karts was adorable and thrilling, no doubt a nod to Mario Kart. The years of friendship between Ralph and Vanellope was well portrayed and deeply convincing, with many touching moments reminiscent more of a big brother and little sister relationship than two best friends. You know, after careful consideration this might have played better as what parent wants their little girl to be friends with a grown man, much less one as big and rowdy as Ralph? Once inside the internet, Ralph and Vanellope find the Search Bar, an actual bar with a librarian-like fellow manning it, called KnowsMore (Alan Tudyk, Rogue One: A Star Wars Story). KnowsMore points them to the Ebay, but upon getting there the pair realize they need real money in order to purchase the wheel they need. And so begins their adventure inside the Internet, trying to raise the funds they need in just twenty four hours before their item is placed back out for auction. Opting for a quick solution, they steal a race car from a different game only to meet Shank (Gal Gadot, Wonder Woman), the lead character in the much darker and grittier racing game. Not surprisingly, Vanellope is enamored with the unpredictability of the new course, and the infinite possibilities coded into the game. Only Shank isn’t quick to let an outsider in, much less take her car, and the two embark on one of the coolest and most action-packed car races that has ever graced an animated film, which also solidifies their touching friendship. Of course, there’s still the matter of making that money and replacing the wheel, so Shank points them in the direction of her good friend, Yesss (Taraji P. Henson, Hidden Figures) to see if she can help. In their attempt to make the money and save the characters of Sugar Rush, Ralph and Vanellope will stop at nothing to get the wheel for her game, taking Ralph to a whole new level – a viral one. And then the unthinkable happens. Vanellope realizes that she might not want to go back to Sugar Rush but stay in Shank’s game instead. Overhearing a private conversation, Ralph becomes consumed with insecurity and unleashes a virus into the game in the hopes of getting Vanellope to leave. However, when he confesses what he did, a rift forms between the two characters who must rush to find a way to destroy the virus before it consumes the whole Internet. It’s so easy to get wrapped up in a goal or a dream, only to not realize that it’s changed or you’ve outgrown it. Vanellope may be a little girl, but her feelings are so powerful she could fill the shoes of any man, woman or child. Ralph Breaks the Internet is filled with likeable and relatable characters, story arcs that make the audience feel for the characters in ways that weren’t evident in the original Wreck-It Ralph, giving an ending so satisfying it will leave you crying and begging for more. The creativity, imagination and love for these characters and the world they find themselves in is so palpable that it’s impossible not to fall in love with Ralph Breaks the Internet.